Frutas del Guadiana Sociedad Cooperativa - Page 4 of 2 - Fruit wholesalers. Crop, sale and export. Frutas del Guadiana, quality on your table. We have an integrated production system that allows us to obtain the best quality fruits, on an efficient and environmentally respectful way . We are devoted with passion and professionalism to the cultivation, sale and export of peaches, plums, nectarines, donut peaches and pears. Flavour, colour, aroma and firmness until the consumer. We collect the fruit at the right time and we take care of all the aspects of manipulation to ensure a desirable and healthy product ready to be appreciated by the most discerning consumer. Each piece of fruit that goes through our hands is a gift of health, energy and enjoy for the senses. Frutas del Guadiana feel very proud of what we do and the way we do it. In Frutas del Guadiana, we are dedicated to the cultivation , sale and export of peach, plum, nectarine, donut peach and pears. Our company has been for three generations devoted to care of our fruit , to pamper it, to get as result fruits firm, full of flavor and color to delight customers worldwide. Our farmlands are all located a few miles from our own fruit center and offer modern and functional drip irrigation systems to ensure efficient production of fruits of high quality and environmentally friendly. We are at around Montijo , Badajoz, in the fertile plain of the Guadiana River, in the region of Extremadura, southwestern of Spain. More than 3000 hours of sunshine per year (INE 2012 data) and an abundant supply of water ensure naturally its fruit ripeness, tasty and full of color and aroma. 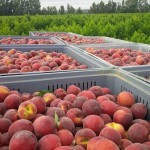 These features make our region is emerging as a leader in production and marketing of stone fruit in Spain. Our goal is to make the fruit reaches the table of consumers as freshly picked from the tree , fresh , firm , tasty and full of aroma and color.